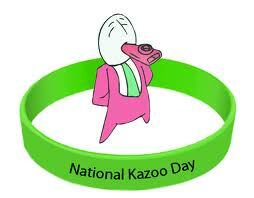 Words From The Hallway: National Kazoo Day! Okay, breaking news. I just found out that I have been kazooing backwards for all my life!!! (The reason I know this is partly because of this picture but also because I informed my friends that it was National Kazoo Day today at lunch and one of them immediately pulled out a small kazoo that she apparently keeps on hand at all times and started playing a song from A Very Potter Sequel, among other songs. (So cool, right? I must now put an emergency kazoo in my backpack, for just such an occasion. Be prepared, and all that jazz.) And apparently, you play a kazoo with the smaller, not the larger, end in your mouth. Well, there's nothing wrong with being unique. Just like everybody else. "You can't just ask someone what world they live in! Take it back!" Sorr-ree. "I'm gonna get a reward for putting a shark on somebody's head." Um. How nice for you. ...what did you do with the shark afterwards? Person 1: "I know they're dating!" Person 2: "We are not! We are not even close to dating!" Person 1: "I saw him get down on one knee and propose to [Person 2]!" Person 2: "Why am I always the last person to hear about these things?" ...that is a very good question. I used to be an illustrious kazooist myself. I DO keep it on hand at all times! I need it in case I get bored! Although, seriously, I went around for, like, a week worried that I was playing it backwards. We got them at church and EVERYONE played them with the small end out and I was like, um, hello? The bell should be on the OUTSIDE, am I right? Then I asked Dr. Reynolds at DPYO, and he said I was right. He's a professional, so I trusted him. Your mom must be an idiot if she taught you to kazoo wrong...poor child! But of course, thecornerchair! I agree wholeheartedly and agreeably! LOL for inside jokes, charli.